LI68.20-P-064401 - 222 up to VIN A219999 & 217 A013008 front center stowage compartment rattle when open, replace compartment do not line with felt. LI42.10-P-064900 SEPT16 – all 222, 217 (without AMG) rear axle brake judder/shudder when braking, brake disk thickness variation. Replace disks & pads. I'm new to this site. I've been researching cars for my next purchase and am very close to selecting a new S-Class. However, I'm a bit surprised by the number and type of service bulletins for this car that range from cosmetic (e.g., radio, interior lights, etc) to more serious (e.g., cannot start engine, cannot open lock to enter car, trunk opens on its own, etc). My perception seems to coincide with the enclosed JD Power initial 90 day survey of 2015. From what I've read, my understanding was that MB was taking steps to improve quality, and that it had actually made significant improvements over the past few years. Do you feel MB is actually taking constructive steps to improve quality, particularly for the S-Class? And, for those who actually own the W222, are you afforded quality service by the dealership you bring your car to for maintenance and repairs? Love the car, but wonder if MB is doing a good enough job to put quality above profit. LI32.50-P-064467 SEPT16 – 222 & 217 with ABC (487) unusual handling characteristics by random sprung mass vibrations, replace affected acceleration sensor. LI68.10-P-065069 OCT16 – 217 between VIN A015892 & A018355 AC regulators have excessive resistance (friction between trim ring & regulator), remove and reinstall. Thanks for helping. I'm still confused on how to decipher if the SB pertain to my car. Konigstiger - do you know if there's been an update here? * LI82.85-P-060796 FEB15 – 222, 217, 205 w/COMAND online (code 531) and code 805 when AUTO button on A/C is pressed no change is indicated in central display. Although auto function is active (red LED) instead of AUTO there are digits for air distribution & blower. AUTO may display but disappear sporadically when vehicle is started or screen content changes. AUTO function is not impaired, software remedy expected to be available 5/15. Recall 016100004 NOV16 – 2016 & 2017 217 base-light in the low-beam headlamp may not be properly adjusted, dealer will correct. Approximately 1,004 vehicles affected. Recall 2016110006 DEC16 – 2016 & 2017 217 seatbelt extenders may not retract as intended, dealer will recode software to rear control module. Approximately 682 vehicles affected. Service Campaign 2016110001 DEC16 – 2015-2017 222, 217, 205, 253 relays in the rear fuse /relay module may not correspond to specifications affecting switch-on behavior as a result vehicle may not be able to be started. Dealer will replace. Approximately 23,835 vehicles affected. LI82.85-P-060796 NOV16 – 222, 217, 205 when Auto button on A/C control panel is pressed, no change is indicated in central display. Perform software update of COMAND controller unit with Regio-DVD 09/15 or later. LI91.25-P-065343 DEC16 – 222 w/multi contour seat (432) up to modification year 806 (found on data card) seat function inoperable, install latest software update to pump control unit. Malfunction may be attributed to temporary icing due to large temperature variations. LI91.40-P-065227 DEC16 – 222, 217, 205, 253 PRE-SAFE inoperative (fault message in instrument cluster), perform software update on emergency tensioning retractors if not possible replace seat belt. LI91.10-P-065541 JAN17 – 222 Maybach backrest noise when dynamic seat deflates, install felt strip to hook-in wire. LI82.85-P-065742 FEB17 – 2017 222, 217, 205 with reversing or 360 degree camera (code 218 or 501) black screen may appear with message "Observe surroundings”, update COMAND software. 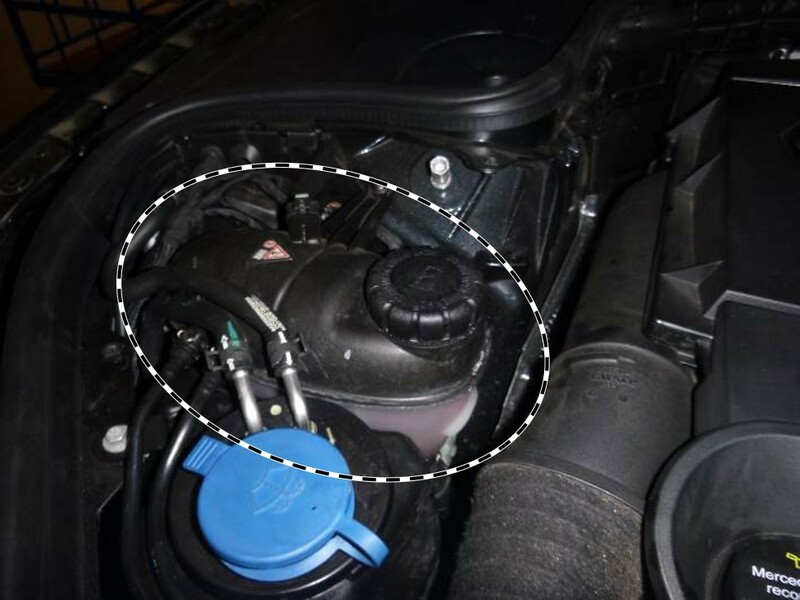 LI20.20-P-065832 MAR17 - 222 VIN A154031 up to A276182, 217 A005589 – A01876 CEL stored fault code P012800, retrofit check valve in return hose of additional engine radiator. See images below. LI82.85-P-065949 MAR17 – 117, 156, 166, 172, 176, 190, 205, 207, 213, 217, 218, 222, 231, 238, 242, 246, 253, 292 with code 360, 362, 364 (HERMES communication) SOS message “Service Not Activated” code B15CE00. (1) Perform recommissioning with XENTRY Diagnosis and then conduct a brief test drive. If this is not effective, please create a PTSS case (MB technical assistance). (2) Contact Verizon Telematics Dealer Support at 877-826-6319. If the complaint cannot be resolved by Verizon Telematics, create a PTSS case. Last edited by konigstiger; 03-27-2017 at 01:12 PM. Recall Campaign 2017030015 APR17 - 2006 through 2016 117, 164, 166, 190, 204, 205, 207, 211, 212, 218, 221, 222, 231, 253, and 463 vehicles that received a control module coding update while at dealer between December 3, 2016 and December 5, 2016 might not function as intended dealer will update the affected control modules. LI91.12-P-066077 222 with code 223 noises from backrests of individual rear seats, grease rear backrest mounting. Last edited by konigstiger; 04-24-2017 at 02:44 PM. Do you know how I can get my hands on the actual TSB Service Campaign 2016110001 DEC16 – 2015-2017 222, 217, 205, 253 relays in the rear fuse /relay module may not correspond to specifications affecting switch-on behavior as a result vehicle may not be able to be started. Dealer will replace. Approximately 23,835 vehicles affected? My dealer performed this today and did some damage to my rear entertainment system ( I have the four place seating with the tray tables). I am trying to figure out if they had to get into the trunk. Thanks in advance of how I might get a copy of what the dealer does in this service campaign. I just got the car home a couple of hours ago and notice they broke the one hinge to the cover that goes over the compartment where the dvd/refrigerator goes. Circuit 15 relay has to do with battery (see attachment), if replaced loss of power may require Xentry diagnostics to restore proper function. Thank you for the copy of the bulletin. It was very helpful. Also, thank you for providing the information that you post. You are a true asset to this website. Thanks again. Anything regarding 2017 W222's/C217's and a vibration felt in steering wheel only when idling and in gear? Last edited by RJC; 06-11-2017 at 08:53 PM. So did I. Mostly gone now. Look for the post by Konigstiger for the fix, maybe a year or 18 months ago. LI82.70-P-066766 JUL17 – 2017 222, 217, 205, 253 (with codes 531, and 807) address book of mobile phone not transferred “data being read…Please wait” irrespective of phone used, update COMAND software. Sorry for the late reply see my post https://mbworld.org/forums/s-class-c...ml#post7245936 in the coupe forum...have you had yours checked out?